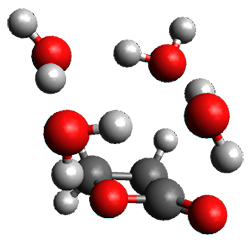 The structure of water about a solute remains of critical importance towards understanding aqueous solvation. Microwave spectroscopy and computations are the best tools we have today to gain insight on this problem. 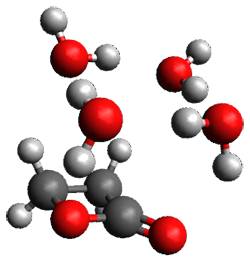 This is nicely demonstrated in the Alonso study of the microsolvated structures of β-propiolactone 1.1 They employed chirped-pulse Fourier transform microwave (CP-FTMW) spectroscopy and MP2(fc)/6-311++G(d,p) computations to examine the structure involving 1-5 water molecules. The computed structures of these microsolvated species are shown in Figure 1. The deviation of the computed and experimental structures (RMS in the atomic positions) is small, though increasing as the size of the cluster increases. The deviation is 0.014 Å for the 1. H2O cluster and 0.244 Å for the 1. (H2O)5 cluster. 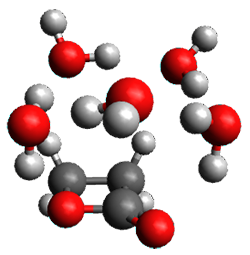 They identified two clusters with four water molecules; the lower energy structure, labeled as a, is only 0.2 kJ mol-1 more stable than structure b. Figure 1. MP2(fc)/6-311++G(d,p) optimized geometries of the hydrates of 1. Water rings are found in the clusters having four or five water molecules, while chains are identified in the smaller clusters. One might imagine water cages appearing with even more water molecules in the microsolvated structures. (1) Pérez, C.; Neill, J. L.; Muckle, M. T.; Zaleski, D. P.; Peña, I.; Lopez, J. C.; Alonso, J. L.; Pate, B. H. Angew. Chem. Int. Ed. 2015, 54, 979-982, DOI: 10.1002/anie.201409057. Here is a story that must drive chemical database quality control personnel nuts. Song, et al. 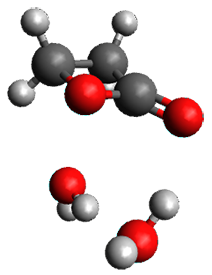 noticed that the reported 13C NMR of the natural products cephalosporolide C 1, cephalosporolide J 2 and bassianolone 3 are identical.1 Given that it is highly unlikely that two diastereomers would have identical NMR spectra, the likelihood that these three have identical spectra seemed remote at best. Compounds 1 and 2 were synthesized and their structures confirmed by x-ray crystallography. Their 13C NMR spectra show clear distinctions, indicating that the isolated “2” is actually 1. Experimental support for the notion that 1 and 3 are actually the same was provided by preparing the diacetylide of 1 and comparing its NMR spectra to that of natural “3”. Quantum computations confirmed that in fact the natural product thought to be 3 is actually 1. The structures of 1 and 3 were optimized at B3LYP/6-311+G(2d,p) and 13C chemical shifts were computed with these geometries at mPW1PW91/6-311+G(2d,p)/CPCM(chloroform). (The computed structures are shown in Figure 1.) The mean absolute deviation (MAD) between the computed and experimental spectra for 1 is 0.97 ppm, while the MAD for the computed spectrum of 3 compared with the experimental values is 2.44 ppm, with a maximum error of 5.13ppm, more than twice the maximum error with structure 1. 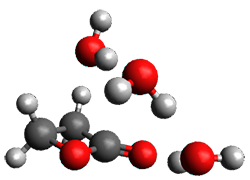 The authors attribute the misassignments to a faulty initial spectra of authentic cephalosporolide C 1. Figure 1. B3LYP/6-311+G(2d,p) optimized geometries of 1 and 3. (1) Song, L.; Lee, K.-H.; Lin, Z.; Tong, R. "Structural Revision of Cephalosporolide J and Bassianolone," J. Org. Chem. 2014, 79, 1493-1497, DOI: 10.1021/jo402602h. I have posted on the use of computed NMR chemical shifts and coupling constants to help aid in structure identification. The second edition of my book Computational Organic Chemistry has a largely all-new chapter on structure identification aided by computed spectra, especially NMR spectra. 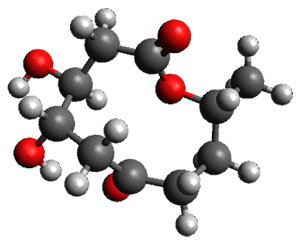 In my recent opinion piece speculating on challenges in computational organic chemistry,1 the first area I highlight is encouraging the larger use of computed spectra as an essential component of structure determination. While more and more non-traditional computational users are employing quantum computations towards these problems, I suspect that many non-users are a bit wary about stepping into an arena they are not expert in, an arena chock-filled with acronyms and methods and potentially little guidance. While some very nice papers2-6 and web sites (Chemical Shift Repository (Cheshire) and DP4) do outline procedures for using computations in this fashion, they are not truly designed for the non-specialist. Well, fear not any longer. Hoye and coworkers, synthetic chemists who have utilized computational approaches in structure determinations for a number of years, have written a detailed step-by-step protocol for using a standard computational approach towards structure determination.7 The article is written with the synthetic chemist in mind, and includes a number of scripts to automate many of the steps. Utilize MacroModel to perform a conformational search for each proposed structure, retaining the geometries within 5 kcal mol-1 of the global minimum. Optimize these conformations for each structure at M06-2x/6-31+G(d). The article is straightforward and easily guides the novice user through these steps. Anyone unsure of how to utilize quantum chemical computations in structure determination is well advised to start with this article. (1) Bachrach, S. M. "Challenges in computational organic chemistry," WIRES: Comput. Mol. Sci. 2014, 4, 482-487, DOI: 10.1002/wcms.1185. (2) Lodewyk, M. W.; Siebert, M. R.; Tantillo, D. J. "Computational Prediction of 1H and 13C Chemical Shifts: A Useful Tool for Natural Product, Mechanistic, and Synthetic Organic Chemistry," Chem. Rev. 2012, 112, 1839–1862, DOI: 10.1021/cr200106v. (4) Jain, R.; Bally, T.; Rablen, P. R. "Calculating Accurate Proton Chemical Shifts of Organic Molecules with Density Functional Methods and Modest Basis Sets," J. Org. Chem. 2009, 74, 4017-4023, DOI: 10.1021/jo900482q. (5) Smith, S. G.; Goodman, J. M. "Assigning the Stereochemistry of Pairs of Diastereoisomers Using GIAO NMR Shift Calculation," J. Org. Chem. 2009, 74, 4597-4607, DOI: 10.1021/jo900408d. (6) Smith, S. G.; Goodman, J. M. "Assigning Stereochemistry to Single Diastereoisomers by GIAO NMR Calculation: The DP4 Probability," J. Am. Chem. Soc. 2010, 132, 12946-12959, DOI: 10.1021/ja105035r. (7) Willoughby, P. H.; Jansma, M. J.; Hoye, T. R. "A guide to small-molecule structure assignment through computation of (1H and 13C) NMR chemical shifts," Nat. Protocols 2014, 9, 643-660, DOI: 10.1038/nprot.2014.042.